Bowers Group has recently supplied Merlin Circuit Technology Ltd with a Baty Venture Plus 6460 for the accurate measurement of printed circuit boards. Established in 1992, Merlin Circuit Technology specialises in the manufacture of high technology, rigid printed circuit boards. Based in Deeside, North Wales, the company offers a range of services including the manufacture of small to medium volume printed circuit boards, consisting of between 2 and 32 layers. Merlin Circuit Technology offers comprehensive technical support from design to manufacture, ensuring all boards are fully tested, and with full First Article Inspection Reports available on request. The AS9100 accredited company firmly believes that quality is the most important part of their business, and are totally committed to the high standards of the products it produces. The Baty Venture Plus 6460 is used by Merlin Circuit Technology for measuring finished printed circuit boards prior to despatch, in order to verify that they meet drawings and specifications provided by the customer. The printed circuit boards manufactured at Merlin Circuit Technology vary in shape, size and complexity, and include double sided printed circuit boards and multilayer printed circuit boards with up to 32 layers. In addition, the company uses the Venture to verify drill machine and route machining accuracy. The high technology printed circuit boards made by Merlin Circuit Technology are supplied for use in high end commercial applications, including medical applications, and for use in the aerospace, defence and security sectors. The majority of circuit boards manufactured have extremely tight tolerances of +/-0.10mm, therefore the accurate measurement of the circuit boards is of the upmost importance. Merlin Circuit Technology previously used measurement methods including vernier calipers, pin gauges and micrometers, but found the measurement of radiuses, curves and complex cut outs a struggle with these types of instruments. The Baty Venture Plus 6460 gives the company the ability to accurately measure radiuses and curves, and is very simple and easy to use. 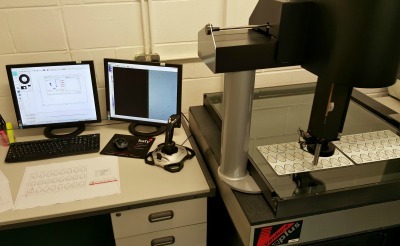 The Venture Plus has also allowed Merlin Circuit Technology to generate First Article Inspection Reports more quickly and with greater ease. With the assurance of quality high on the company’s agenda, these formal measurement reports for their manufacturing process are a key factor in their production of circuit boards. 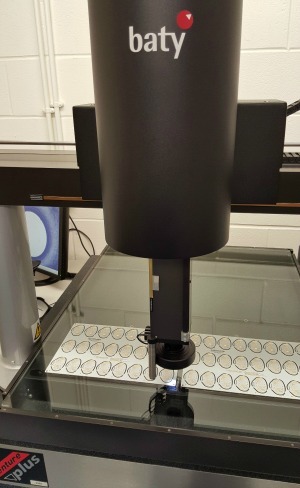 The Venture Plus 6460 Baty Vision System features a 640mm x 600mm x 250mm measuring range. Its bridge type construction is all aluminium, resulting in low inertia and low thermal mass. Air bearings are used on all axes and a granite Y beam is used for increased accuracy. This ensures that the machine will expand and contract uniformly with temperature changes, ensuring minimal distortion and subsequent errors. The Venture Plus is complete with standard zoom optics and programmable, segmented LED surface lighting.